The country’s protracted war has decimated much of its infrastructure, and 22 million people — at least 75 percent of the country’s population — require humanitarian assistance every day. More than 9,000 people have died since the conflict began, according to the U.N.’s Office for the Coordination of Humanitarian Affairs, though other estimates have placed the toll much higher. The Saudis argue that shipments through Yemen’s Houthi-controlled ports include caches of weapons from Iran going to the rebel group. Now, more than 11 million children have nutritional, medical and educational needs, according to UNICEF. About 2 million people are internally displaced, by UN tallies. Malnutrition is also rampant, and as many as 16 million people lack access to safe drinking water and sanitation, according to UNICEF. The UN’s humanitarian arm also published that there have been more than 1.1 million cases of cholera reported since last April. The government has not paid public sector employees since August 2016, including medical workers like doctors and nurses in the health ministry, so many hospitals and clinics around the country sit closed without staff to operate them. Yemen’s currency is declining in value as prices for food and other goods go up. IRC has been on the ground in Yemen since 2012. The group has more than 400 staff in the country, and most are Yemeni. IRC repairs water treatment plants and provides physical and monetary support to sanitation systems across the country. IRC also backstops the decimated health system in both the north and south of Yemen by providing clinics with essential drugs and medical supplies, and by sponsoring outpatient treatment centers and mobile clinics. The organization also provides cash assistance to families struggling to buy food. “It’s hard to overestimate how dire it is,” Amanda Catanzano, IRC’s senior director of policy and advocacy, told the PBS NewsHour. Oxfam has worked in Yemen for more than 30 years. The organization has provided “some form of assistance” to 2.8 million people since the conflict escalated in March 2015, said Scott Paul, the humanitarian policy chief of Oxfam America. 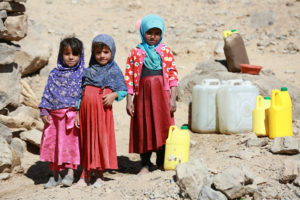 Oxfam works with local Yemeni humanitarian organizations providing aid. One of the Oxfam’s main pushes has been the distribution of clean water across the country via trucks and the rehabilitation of wells and water pumps for residents. As food prices have skyrocketed, Oxfam has also distributed cash and meal vouchers to residents so they can access food. “There’s plenty of food in the market but because the economy is so poor and because [of the] Saudi port restrictions, people can’t afford to buy what’s in the market anymore,” said Paul, who visited Yemen in April. ICRC supports health care structures in five governorates, providing them with medical equipment, medicine and advice. The group also says it’s the only organization that supports dialysis centers in the country. There are 28 operational dialysis centers in Yemen, and ICRC operates five of them. ICRC’s water and habitat engineers work to help civilians get clean water and the group sends personnel to sewage treatment centers around the country. The organization also imports medicine like insulin and first aid kits. Doctors Without Borders (MSF) has been operating in Yemen since 1986. MSF provides sustained medical treatment throughout the country. It operates 13 hospitals and health centers and provides support through supplies, medical advice and staffing to more than 20 hospitals in 11 governorates within Yemen. MSF hospitals treat malnutrition, cholera, malaria and other medical needs for Yemenis that arise. As of February, MSF has more than 1,800 staff working in Yemen. The group runs programs on the ground in Yemen focused on children’s health. Save the Children trains medical workers in Yemen and provides health centers with financial support and medical supplies. Its mobile health clinics and nutrition units, staffed with doctors and nurses, treat children and families in remote areas. The organization also distributes food and cash vouchers for families to buy food. Additionally, the group runs educational programs for kids and maintains facilities where children can “play, have a sense of normalcy and begin to recover from the stressful and traumatic experiences they have had,” Director of Communications for Save the Children Humanitarian Response Erin Taylor told the PBS NewsHour. International Medical Corps is an emergency medical relief organization that trains local medical staff and sends resources to countries in the aftermath of disasters. The group has staff on the ground supporting 77 medical clinics and 14 mobile health centers in Yemen as of April 2017. IMC staff assist thousands of children and pregnant women with nutrition programs and educate 13,000 people per month about nutrition. The group also trains health workers across the country and delivers medicine and medical supplies to facilities to keep them operational. It also distributes hygiene and water sanitation kits to communities where clean water is inaccessible, and because clean water is at such a premium, supplies water by truck to medical centers that don’t have it. This list is not exhaustive, but it is a good place to start. Please do your own research to make sure your aid dollars go as far as they possibly can in the right direction. Visit Charity Navigator if you aren’t sure whether an organization is trustworthy.